Yes, I realize it's a little too early for Thanksgiving. Although when you think about the fact that it's already mid-September, Thanksgiving (Canadian version) isn't actually all that far away. 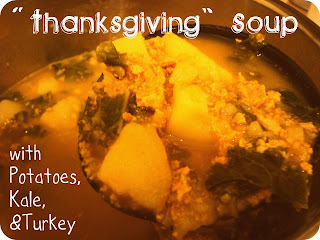 Regardless, this post has nothing to do with Thanksgiving other than the fact that I named my soup to reflect the ingredients found in it. Feeling ever-so-slightly stressed on Monday, I posted a recipe for a Comfort Soup. I was missing several of the necessary ingredients so I scoured my fridge to find something else that would warm and comfort me while I tried not to turn every hair on my head white. Side note: I've been finding the occasional white hair when my hair starts to grow out and the highlights no longer cover the first 3 inches from my roots (I'm cheap and try to go as long as I can in between appointments). There's such a satisfaction in plucking them out, not because I feel like I'm avoiding the aging process but instead because those suckers are as thick as whiskers! That's how they're supposed to feel, right? Am I turning into an old man or a cat? Craving something comforting for dinner, I remembered I had ground turkey in the fridge that I had meant to use in the cavatappi gratin. I decided that turkey meatballs would be both warm and comforting so I started prepping my necessaries. When I first began cooking I would make meatballs by pulling off a small chunk of ground beef, rolling it between my hands, then frying it in a small puddle of oil. I don't recall which show reformed me and my meatball masacres but I've never made meatballs since without adding in an egg to bind it (One egg to rule them all. One egg to find them. One egg to bring them all and in the darkness bind them...I've had too much alone time this week. Send help), among other things. This soup was created over the course of 2 days. I made 10 meatballs on Monday night then cooked up the rest of the turkey in a pot. I didn't have potatoes or kale so I grabbed some on Tuesday and put it all together last night. I also should have gotten chicken stock but luckily we had a few packets of beef stock kicking around so I was able to flavour the broth. The beef certinly isn't bad but I'm going to recommend you use chicken broth. Preheat the oven to 350 degrees and grease a baking sheet. In a bowl, place 1 pkg of thawed ground turkey. Using a fork or a wooden spoon, mix in 1 egg, 1 cup chopped green onion, 1/4 cup shredded cheese (I used very finely diced halloumi - needed to use it up and thought it might offer an interesting texture because of it's high melting point), 1/4 cup sour cream (using this in place of ketchup gave the meatballs such a tender consistency), 1/3 cup Italian bread crumbs, and salt and pepper. Mix together until combined. For meatballs: scoop about 1 tbsp of meat out of the bowl and roll between your palms to create a ball. Place on the baking sheet and repeat. Bake for about 30 minutes, longer if you make bigger meatballs. If you choose not to do meatballs, brown the meat in a pot over medium heat, stirring every so often to break up the meat and to ensure it cooks thoroughly. Meanwhile, set a pot of water over high heat and bring to a boil. Cook 3 potatoes until they become tender (stick a fork in them to test this), about 15-20 minutes. It's okay if the potatoes are not entirely tender at this point because the potatoes will cook again later. Once tender, cut the potatoes into large chunks. If you want to remove the skin it should slip off of the potato fairly easily at this stage. Rinse the potato pot and add one of the potatoes, cut up, back to it. Add in 1 tbsp butter and 2 tbsp milk and mash the potato. To the mashed potato add in 6 cups of water and about 6 tbsp of chicken stock. If you use canned broth use 2-3 cans. Add in the rest of the potatoes and add in the cooked ground turkey. Chop up enough for 2 cups of kale then add to the soup. Bring to a boil then reduce heat and allow the soup to simmer until the kale has wilted. Serve and enjoy! *I've updated this post with information on how you can support the Ride to Conquer Cancer!